The author of the newly released book "The Brat Chronicles" by Michael Ritter '73 Kaiserslautern recently did a presentation with Donna Musil at St. Edward's University in Austin, Texas and will be the "entertainment" on Friday 3 August 2007 at the Overseas Brats Homecoming in Dallas, Texas. Autographed books will be available for purchase. "The Brat Chronicles" had me laughing out loud from the first chapter. The Griswold Family has nothing on the Ritters. From falling in French toilets to feeding seven on a Master Sergeant's salary, "it's all just part of the adventure". Michael Ritter may well be the Jeff Foxworthy of Brats! 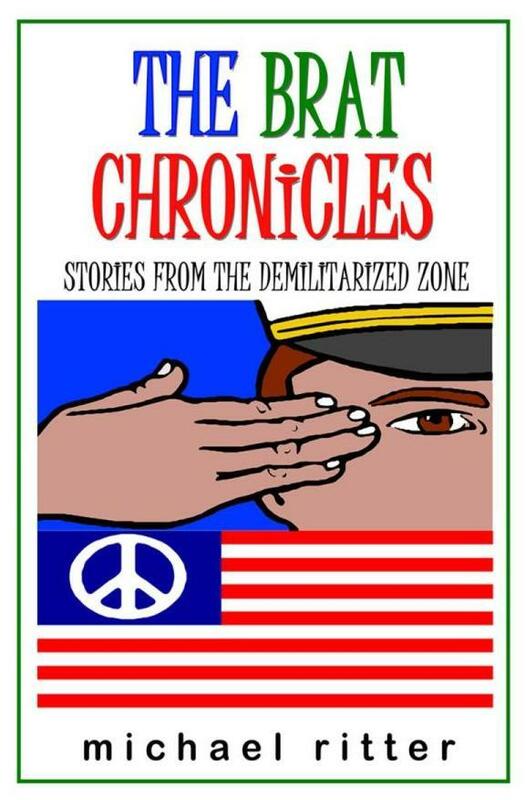 Click here for more Books by, for and about Brats. 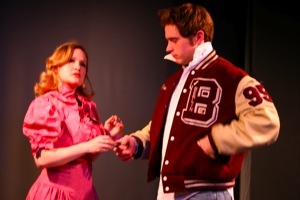 A '95 BERLIN letter jacket was noticed on stage at Ratutu Collaborative. Click here to view their archives. It seems the Managing Director is a BERLIN Brat. Here's Rebecca Trent '95 as a 7th grader and as a Freshman. Rebecca, is that your jacket? Did you receive your White Baseball Cap or Sun Visor from the 2006 Reunion? If not, please contact us at BERLINBrats@gmail.com and we'll mail you one. The Welcome Desk in BERLIN thought they had passed them all out (a gift from our Hotel) but after the Reunion discovered 2 small boxes still in the Hotel's storage room. Both are white with "BERLIN Brats, the Bear and Homecoming 2006" in maroon print on the front. We'd like you to have this souvenir so drop us a line. Click here for the latest news on Coach Byron Smith FAC '70-'77. Click here for the latest news on Coach Brown FAC '88-'94. The BERLIN Brats were featured in the Feb/Mar 2007 Reunions Magazine. Click here for a (1MB) copy of the cover and article. Click here for a (23MB) copy of the entire magazine. From February to June, 2007, "BRATS Film Tour: Our Journey Home!" will be screening the film at select locations around the country, and writer-director Donna Musil will be attending almost all of these screenings. They'll kick off the tour in San Francisco, cross the country from Phoenix to Ft. Hood to Virginia Beach, then finish with their big "BRATstock" blowout in Washington, DC! There's nothing like seeing this film with a theater full of BRAT NATION, all laughing and crying in unison. So grab a friend and join in! Because sometimes... you actually can go home again. They will also be sponsoring their BRATS Without Borders MENTOR PROGRAM at various locations throughout the tour - bringing together Vietnam-era brats with Iraq-era brats to talk, share experiences, and let each other know they're not alone. If this is something you might be interested in sponsoring or attending, please let them know. Maggie (Ellithorpe) Stafsnes '63 wrote an article "BERLIN Brats celebrate Homecoming" which was featured in the Winter edition of the AOSHS Quarterly. Watch the TV clips that were shown on the news in Germany. Click here for the FAB Hallo BERLIN TV Clip. Click here for the RBB Aktuell TV Clip. Click here for the latest news on Frau Dr. Erika Schirmer. BERLIN Brats in the Press! After obtaining the BERLIN Wall, (yes, a 14,000 pound Section) the BERLIN Brats thought they indeed had everything! Then a mysterious padded package showed on their doorstep recently. Inside, their very own BERLIN Brat "Postage Stamp." The stamp depicts this year's reunion logo and was produced by longtime, parent-supporter Mr. Curtis Carter. (Mr. Carter's daughter Betty is from the class of '72). Every 3 years at Reunion time the BB design a new Reunion Logo to incorporate their school mascot and their reunion location. This July with the group's 1st ever return to their roots, BB graphic artist Susan Sams '85, modified the BERLIN City Flag w/Bear and added the text "Homecoming 2006" to convey the sentimental journey. If others are interested in designing their own stamp you can do so at www.zazzle.com/stamps. They are sanctioned by the USPS. Special Endorsement from the Check Point Charlie Foundation! This year, after learning of our "Homecoming Reunion" and our "Allied Museum Special Exhibition" the BERLIN Brats have just learned we will be the recipient of a 1,000 Euro Donation to underwrite the expense of our luncheon at the Allied Museum, on Friday, July 28th at our upcoming Reunion. We are indeed grateful for this donation and the recognition bestowed on us by the Foundation. Our heartfelt thanks to Herr Alexander Longolius, BAHS Faculty member from '58 to '67, and Chairman of the Executive Board. For more information on the Foundation please visit our Links Page or www.cc-stiftung.de/en/. Click here for information on "us" at Wikipedia, the free encyclopedia. Rebecca Pidgeon sings "Army Brat"
Rebecca Pidgeon released the CD "Tough on Crime" in Oct 2005. The bonus track "Army Brat" is currently featured on United Airlines in-flight audio programming. Click here to listen to a sampler on amazon.com. Julia Starbuck '76 has been featured on Milwaukee billboards, TV, the newspaper, and radio for her annual donation of 500 pounds of tomatoes to the community. After six long years, I am proud to announce that the first documentary about growing up military - BRATS: OUR JOURNEY HOME - will be released on DVD the second week of January, 2006! We may have to cut a shorter version for television, but I decided to release the 90-minute "director's cut" to you early because you're the people for whom I made the film - my fellow brats. For six long years, you donated your time, your money, your thoughts and feelings. You encouraged me when I needed it... supported me when I had nowhere else to turn... and never, ever gave up on me or the project - even when all logic seemed to dictate otherwise. Thank you. I hope the film means as much to you as it does to me, because we were certainly all in this together. As you might expect, the past few months have been rather hectic. We previewed the film at a couple film festivals and reunions last summer, as well as the Families in Global Transition Conference in Houston in September. All were overwhelming successes. I spent October and November finishing the film, then over the Thanksgiving holiday, I was invited to attend the International Documentary Festival in Amsterdam and made some excellent inroads into releasing the film internationally. We'll see what happens. In the meantime, if you'd like to order a copy of the film, click here, fill out the order form and follow the instructions. Your copy will be mailed to you hot off the press around the second week of January! Thanks again, everyone, for all your help. We did it! Click here to learn more about the Artifacts needed. The Allied Museum in BERLIN (formerly our old Outpost Theatre) has decided to do an "American Education Experience Exhibit" at the Museum to open the week of our Reunion in 2006. The exhibit they propose will cover the entire history of the US dependent schools in BERLIN from 1946 to 1994. They see BERLIN (Im Gehege school, Thomas A. Roberts and BERLIN American High School) under the Four-Power-Status under the Cold War as unique schools, different even from going to other schools in the former West Germany. To quote, "BERLIN Brats had the chance to gain experiences you could have made gained nowhere else as in BERLIN - and the exhibit should focus on that fact." Katrin resided in BERLIN from 1953 to 1971 when she graduated from BAHS. She has been active with the BERLIN Brats from the very beginning, is the Class Contact for '71, and now resides near Frankfurt. She has direct access to the Director and Curator. She is married to Bill Planz, also a graduate of '71, who along with Mr. Bluem rescued our memorabilia from the school when it closed in '94. Joe resided in BERLIN for over 20 years and is a Library Associate at West Virginia University. Unofficially, he has become our resident historian. We probably need to make him official! Click here to see Joe's "The BERLIN Observer" website. After leaving BAHS Herr Longolius went into politics in BERLIN. He held many positions and is very well known throughout BERLIN. Presently he is involved with the Initiative BERLIN-USA e.V., a non-profit organization that has a shared interest in German-American relations. He still resides in BERLIN and still travels extensively in the political arena. Mr. Bluem taught Social Studies, World Regions, History and American Government. He last taught at Lakenheath American High School but is now retired in BERLIN. Frau Flohr is presently on staff at Wilma Rudolph Oberschule (our former school) and is largely responsible for our touring BAHS and possibly holding a dance there during our Reunion in '06! With her former ties to BAHS and presently on staff at Wilma Rudolph Oberschule, Frau Flohr will play a vital role in this endeavor. Being sure to identify yourself, class year, and what you have to contribute. Click here to learn more about the Museum Project. 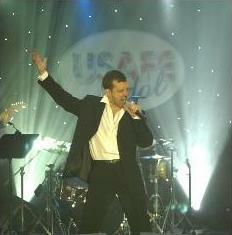 Larry Speer '83 wins USAFE Idol Contest! RAMSTEIN AIR BASE, Germany - Move over, Ruben. Make room, Kelly and Fantasia. The Air Force has its own "idol" in Europe. Maj. Larry Speer, who got a rousing ovation from his home base crowd for singing Neil Diamond's "America," won the U.S. Air Forces in Europe singing contest on Saturday at the Ramstein Officers' Club. Speer, a C-20 pilot with the Ramstein-based 76th Airlift Squadron, never thought he had a chance when he first heard the other seven singers. "Vocally, they are amazing," he said, clutching his first place trophy. "I just had no clue what was going to happen." About 900 people attended the first-ever talent show that brought together the best Air Force singers from around the region. Pop singing couple Nick Lachey and Jessica Simpson, who put on a star-studded variety show on base Friday, gave out awards to the finalists. Click here for a videoclip of "Coming to America." Click here for a VERY shaky videoclip of the Awards Presentation. It's all here! From the World War II years to 2003. A double CD set. Over 2 hours of great radio moments. From AFN BERLIN, Frankfurt, Munich, Kaiserslautern, Stuttgart, Heidelberg, Soesterberg, Würzburg, Nürnberg, Bremerhaven, Orleanas, Poitiers, SHAPE, Bosnia, and the Balkans. Remember those tones at the top of every hour? "It's 16 hundred hours..Central European Time.. This is the American Forces Network Europe". "Z-FM" "Z88-FM BERLIN" "Z-100.2 Kaiserslautern" "Z-98FM Frankfurt"
Garry Moore, Shadoe Stevens, Wolfman Jack, Don Imus, Charlie Tuna, Casey Kasem with Casey's Cavern and American Top 40. Great music programs from country artists Jeannie Seely, Bobbi Gentry, Johnny Bond, Jimmy Wakely. Jazz with Bobby Troop and Duke Ellington. Mystery programs like Adventure Theatre, Midnight Mysteries, CBS Radio Mystery Theatre, and Theatre Five. The great western that began on radio, Gunsmoke with William Conrad as Matt Dillon. Interviews with Louis Armstrong, Bill Haley, Bob Hope, Frank Sinatra, and Elvis. Historical moments: GEN Eisenhower's farewell, GEN Lucius Clay's Freedom House Award, the Nürnburg Trials, the BERLIN Airlift, the building and the falling of the BERLIN Wall, the Iran Hostage Crisis. AFN's most memorable programs like: American Music Hall, Bavarian Bandstand, Town & Country, Classics in Pop, Music in the Air, This is Germany, 16 OH 5 TO Nashville, On the Scene, AFN Tonight, Weekend World, C&W Hit Parade, The Golden Days of Radio and Nightside. Click here to order from our Brat Store. Cost: $17 for the 2-CD set with includes a 27-page CD booklet chronicling the 60-year history with text and photos. Postage is included. A national museum for and about "military brats" is about to get a new push in Wichita. Organizers of the American Overseas Schools Historical Museum already have eight acres donated by the city. They have a design for the complex created by Wichita architects Schaefer Johnson Cox Frey and Associates. And they have purchased two buildings at 704 and 708 W. Douglas for temporary archives space. Now they're trying hard to get Congress to approve funding for the museum -- at least $15.3 million. Next year is the 60th anniversary of the American Overseas Schools (AOS) system, which has educated 5 million military dependents in foreign schools since World War II. "More than 125 of the House members and 38 senators are ex-military and should support it," said Tom Drysdale, who has been pushing the project for a decade from his Phoenix home. Members of Kansas' congressional delegation are exploring avenues of federal support for the museum, which would be a national center for education research and a hub for AOS homecomings, Drysdale said. The project is not included in President Bush's recently released budget, but that doesn't prevent it from being inserted into a spending bill in coming months, said Chuck Knapp, spokesman for Rep. Todd Tiahrt, R-Goddard. Tiahrt is on the defense subcommittee of the House Appropriations Committee. "It's a very worthy project, and the congressman has great support for it," Knapp said. "But the budgets are very tight." Drysdale was president of the American Overseas Schools Historical Society when it chose Wichita in 1998 over 13 other cities -- including Orlando, San Diego and San Antonio -- as the site for the museum complex. The nonprofit group has proposed a complex consisting of four buildings -- a museum, an auditorium, a visitors center and an archive -- built around a courtyard. It would be in the Museums on the River district, between the Wichita Art Museum and the Seneca Street Bridge. The society has raised nearly $125,000 by selling bricks and stones engraved with member names for the museum's courtyard. It also has saved a nest egg from member dues amounting to about $500,000. Any federal funds would be channeled through the Department of Defense because 95 percent of AOS members are ex-military and the department ran the schools. Drysdale's group has submitted two funding plans: $15.3 million for the museum to be built in one phase in about 18 months, and $17.3 million for the museum to be built in four phases over four to six years. The funding request is accompanied by letters of support from Tiahrt and Sens. Pat Roberts and Sam Brownback, Drysdale said. The society has about 2,500 members. Most are heads of overseas alumni groups representing hundreds of thousands of individual members, Drysdale said. The museum complex would act as a national magnet for AOS alumni. "For those raised overseas, this will be their home school and Wichita will be their home town," Drysdale said. The archives would also serve as a mecca for international educational research, said Drysdale, who is the society's president emeritus and archives director. At its peak, AOS operated 361 schools in 29 foreign countries. Until recently, the group had stored its archives in temporary quarters donated by city officials in the WaterWalk area. When construction of that project began, the group purchased the buildings at 704 and 708 W. Douglas to store the archives. The buildings are being remodeled, and the archives are expected to be ready by April 1. When the proposed museum complex is completed, the archives will be moved there. But the Delano buildings would still be used to process future archival material, Drysdale said. "The archives are growing exponentially," he said. Drysdale was deputy in charge of overseas schools through the Department of Defense for 25 years in Washington, D.C. For four years, he has commuted between his Phoenix home and Wichita to oversee the museum project. He plans to move here to oversee the archives. Wichita, he said, offers a central geographical location for the museum. "Wichita is halfway to everywhere in the country, making it easy for everyone to come," he said. The deciding factor in building the museum here was the city's attitude about it, he said. "When the visitation committee arrived, the city offered a beautiful spot in the museum district on the river and really made us feel at home," Drysdale said. "Wichita just blew the competition away." The opening of the border between East and West Germany - with the sudden opening of checkpoints across BERLIN on November 9, 1989 - was more than just one moment in history. It was the beginning of an exciting and sometimes difficult chapter for Germany, a chapter that is still being written. The United States played a vital part on the path to German unification. No one can forget US President Ronald Reagan standing in front of the Brandenburg Gate in 1987 and making his famous appeal to Soviet leader Mikhail Gorbachev to "tear down this wall." After the fall of the Wall, President George H. W. Bush decisively supported German unification. Without this US resoluteness, voiced by Reagan and Bush and displayed over decades throughout the Cold War, German unification might have remained merely a dream for some time. On this 15th anniversary of the fall of the wall, German Ambassador Wolfgang Ischinger has recorded a special message of thanks to America. The German Embassy is celebrating the anniversary by taking part in a rededication of the display of BERLIN Wall segments in the Newseum's Freedom Park and by spreading the message of German and American friendship across the Nation's Capital with a specially decorated Metro Bus. This InFocus takes a look at the unforgettable moment in history in November 1989, as well as the developments in Germany in the 15 years since. Click here for the video of a special message to the American people, German Ambassador Wolfgang Ischinger remembers the unprecedented and rapid chain of events surrounding the fall of the BERLIN Wall and the key role played by the United States. "Without America's belief in German democracy, German unification might not have taken place in my lifetime." In celebration of the 15th anniversary of the Fall of the BERLIN Wall and in honor of the close friendship between Germany and America, the German Embassy has had a Metro Bus decorated in this theme of friendship. This Metro Bus, featuring work by artist James Yang, will crisscross the city for two months, spreading the message of friendship between Germany and America, not just on a political level but also on an individual level. BAHS is now the Wilma-Rudolph Oberschule. A 23-cent stamp in the Distinguished American Series has been issued for Wilma Rudolph. At 16, Rudolph participated in the 1956 Olympic Games in Melbourne, Australia, and helped her team win the bronze medal in the 400-meter relay. Four years later, at the Rome Olympics, she won the gold in the 10-meter and the 200-meter sprints and anchored the 400-meter relay team. After retiring from running in 1962, Rudolph was a teacher and coach. She set up the Wilma Rudolph Foundation to develop young athletes. She was inducted to the Black Sports Hall of Fame in 1973, the Women's Sports Hall of Fame in 1980, and the U.S. Olympic Hall of Fame in 1983. She died of brain cancer at 54. Click the picture for an article from the German magazine "International Community"
Congratulations to Patty (Sapanos) Williams '66 who won the 2003 Overseas Brats Cruise Giveaway! The $2,700 gift certificate drawing was held at the Wichita Convention & Visitor's Bureau. Way to go Patty! 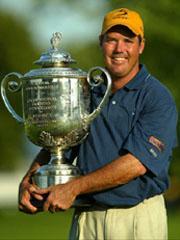 Congratulations to Rich Beem '88 who won the 2002 PGA Championship. Way to go Rich! At the annual AOSHS meeting held in Wichita as part of Homecoming 2001, two BERLINers were elected to fill the two student positions on the AOSHS Board. They were Diane (Green) Kempton '72 and Jeri (Polansky) Glass '72. In addition, Diane was surprised by the Board when they awarded her the "MOST VALUABLE MEMBER of AOSHS!" a well deserved award for all of her hard work. Diane presently chairs the Architectural Committee for AOSHS and has served the Board in numerous other capacities. And for those of you who don't know... Diane also designed the BAHS school flag. She is a woman of many achievements and talents and we are thrilled that she is playing such a major role in the design and development of our archives, museum and visitor's center to be built in Wichita, Kansas. With the celebration of the 50th Anniversary of the BERLIN Airlift, the United States Postal Service issued a commemorative stamp honoring the Airlift. The BERLIN Brats placed a special order with the Post Office. 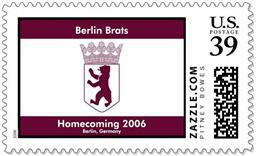 All members of the "BERLIN BRATS" received their newsletters with this special stamp on their envelope.